Tips to make more, spend less, and live your best life. Shopping for her this holiday season shouldn’t be difficult, but we know it is. Add on the pressure of buying the wrong gift and seeing the look of disappointment on her face it’s all too much to bear. But, it doesn’t have to be. Buying a gift for the lady in your life – no matter if it’s your girlfriend, sister, or friend – You can buy something that is pretty, affordable, and most important – wanted. Here are some pretty gifts for her under $50 to buy this Christmas – or any holiday. Getting warm during the winter months can be stylish with this puffer coat ($19.99). Bring Paris to her with this rhinestone leather Eiffel Tower watch. This watch comes in different band colors. How retro and cute are a pair of these low top Chuck Taylors? The lady on your list will definitely enjoy these shoes to slip on to run around the city. Grab them while they’re on sale. ($24.97). These color tinted lip treatments will have lips feeling soft and looking rosy with the Sugar Lip Beauty Box. ($45). The dramatic sleeves on this crop top will look great for a girl’s night or a night on the town. ($27). She will definitely love this clutch purse for the next night out on the town. Give this gift to help her feel fancy schmancy, even with a small price tag. ($21.99). 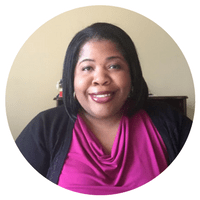 Blogger at Living Simply Fabulous, Shanetta has made a career of turning side hustles into profitable home businesses. A former elementary school teacher, Shanetta shows others how to live life on their terms supported by multiple streams of income. Hey there, I’m Shanetta. I show you how to make more money and save more of what you make, all so you can focus on what really matters – living a fabulous life (while on a budget, of course). If you like to live life to the fullest, but you want to be smart about your coins – you’ve come to the right place. Read more here. Living Simply Fabulous is a participant in the Amazon Services LLC Associates Program, an affiliate advertising program designed to provide a means for sites to earn advertising fees by advertising and linking to Amazon.com.